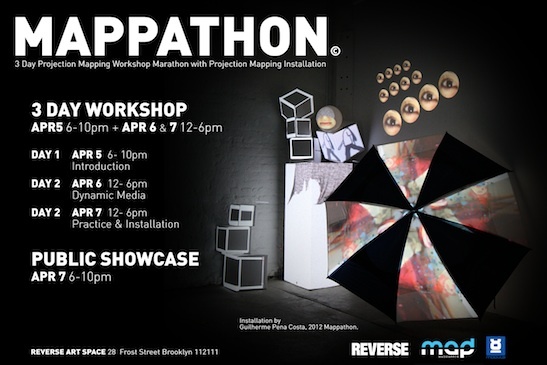 Mappathon© teaches students techniques for manipulating video to create an illusion of deconstruction and redefinition of physical shapes by moving away from traditional flat projection surfaces. The goal of the workshop is to create projection-mapping installations, in which the participants create content for a complex surface. Students will learn the necessary skills to work with these tools in order to create forms and engage with the process of collaborative design. MadMapper will be the primary video software taught in the workshop, and will used in conjunction with Modul8, Quartz Composer, Processing, or Max/MSP/Jitter. MadMapper has simplified the process of working with video projection and enables designers and artists to realize their ideas without being slowed down by technical details. At the end of the workshop, the student’s work will be presented to the public at REVERSE.